It’s Fall on my farmhouse porch today. I always love the seasons as they change on my porch. I think of the book Colette wrote called PARIS FROM MY WINDOW, and I think about Texas from my porch. This is my view of Texas. It’s a very small view of the state, but this is what I see, what surrounds me, and what informs my decisions. As you can see everything is still green although it’s September. Did you see my church pew? It’s it divine? I love the color and how it’s so beat up. I found it in Round Top, but it’s been brought over from Europe. 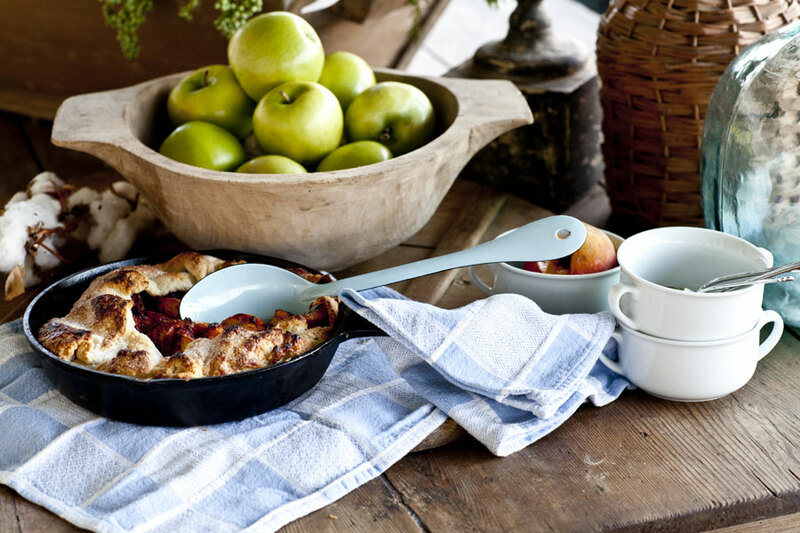 The table is full of things you might have seen a hundred years ago, a homemade peach pie in an iron skillet, fresh apples in a wood bowl, a demijohn bottle, and other goodies. Note the round blue bottle which is very, very rare. The bottle in the which holder is also a blue, but it is more of a cobalt blue. The large wood box is full of cuttings from the farm, antlers I found, some real cotton plants, and a few pumpkins. Has it cooled off where you are yet? Here it is still hot, but I’m hoping for cool sweater weather. I’m ready to snuggle up in my favorite blanket by the fire pit with hot chocolate. 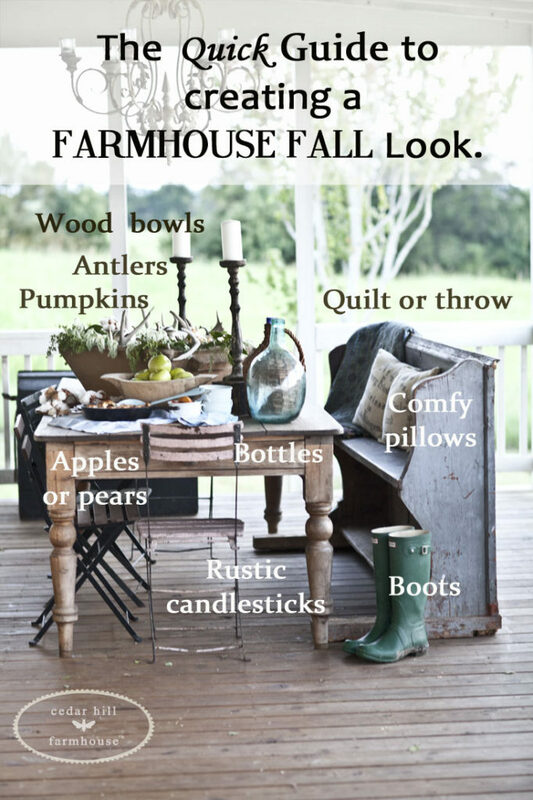 Here are the simple elements I used for the Farmhouse Fall look – wood bowls, apples, antlers, pumpkins, a vintage quilt, soft pillows, farmhouse candlesticks, and boots. Don’t forget about my giveaway. 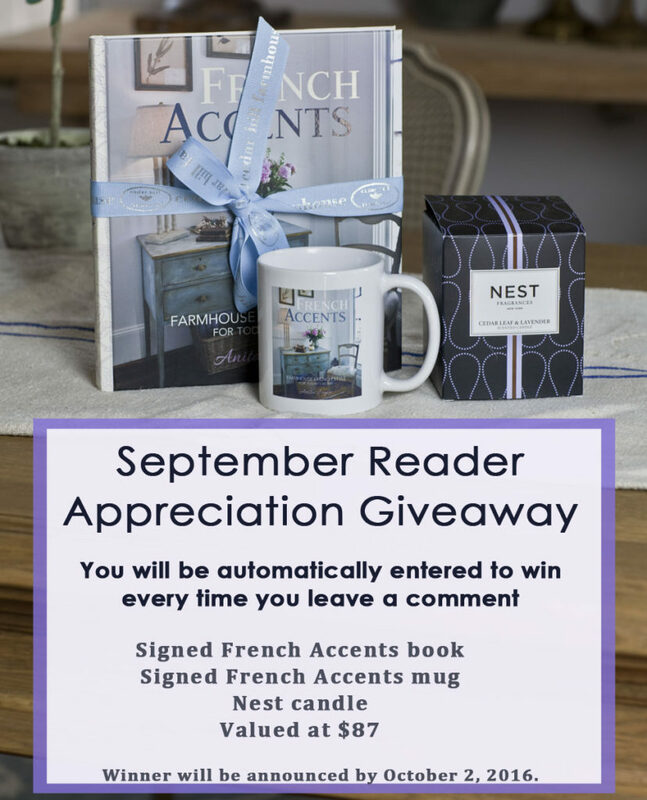 Every comment during the month of Sept automatically enters you to win. Fine print HERE. Love it, Anita. You are so creative and such an inspiration! Thank you for the posts about your daughter and family too. Just got through your book. Thank you always for your inspiring posts! Best always! I love your simple rustic take on fall on the porch! Fall is my least favorite season as I do not love the cold weather here in Colorado. However I do love the Fall shadows and the Harvest moon and I start thinking about Chrustmas as soon has we turn the fireplace on. Such beautiful photos! My favorite part of fall is the cool air, Cinderella pumpkins and football! What a lovely porch! Here in southern Georgia it is still hot and sticky (argh! The humidity!! ), but, like you, I am dreaming of Fall. It can’t get here soon enough. Looking at your lovely pictures, you would think the cool weather had arrived! I’m ready for fire pit nights. Love French Country . ..Trying to work it into my home. Love the ideas. I need all the help I can get. Thank-you for helping me transforming my home. I love this!!! I’m ready for Fall too! I love it! I too can’t wait to dinners hot from the stove – steamy stews and soups, curling up in a blanket with a good book and the fire in the corner of my eye! Here we come fall! Love your tablescape. It looks so inviting. It is also still very hot in southern Missouri. Most days this week were 90 and above with a few episodes of torrential rain. Keep up the great posts. I love the ones about your daughters. Love it, love it, love it. Always looking at your post for French inspiration. No change of season down in South Florida, however I feel it in the air and in my heart! It’s in the 80,s here but the nights are beginning to cool off. I love this time of year in NC. Just beautiful! Such an inspiration for my backyard deck. I always love how you put simple things together to create something so wonderful! How luvly Anita. But that pew…. you got my attention with that! 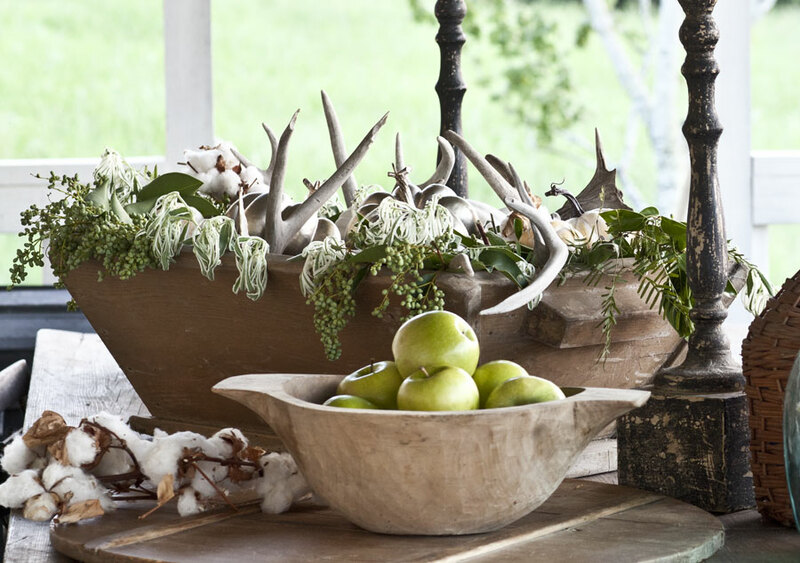 My favorite part of your fall porch is the wooden bowl with the antlers and fall cuttings in it. It’s different and attractive and really fits the fall theme. first thing every morning, your beautiful posts! thank you. Earlier, I read a post about beds, and you made your spread. I wonder if you remember how much yardage you needed for it? it was beautiful! I don’t. 15 yards maybe. Love the blue bottles in a fall vignette! Lovely! I can’t wait for bonfires and Kaluah hot chocolate, and foil packets of veggies and chicken cooked on the outer edges of the bonfire! Sitting on the porch with beautiful candles and great fellowship. Then eventually a return to the bonfire for S’mores of course! And games and snuggly blankets as the evening goes on! Sigh! I love fall! Your picture brought fall into my thoughts! And I love that blue bottle!!! Thanks! Beautiful, cozy and inviting spot….love it! Thanks for the post. Love using my antlers in fall and winter decor, but always trying new ways to display. They are perfect in that bowl, but I really liked a photo on one of your recent blogs with them on the floor in the perfect wire basket. Now why didn’t I think of that??? Don’t get your hopes up on sweater weather. It’s not going to happen there in Houston or here in San Antonio anytime soon, unless you employ my method of turning the A/C down to 60 and pretending! We to have cooler evening. I’m so ready for it to cool down, it’s been in the 90 during the day. I try to enjoy every season. Thanks for your inspiration. Such simple elegance, how beautiful…..
Love opening your daily posts now! Can’t wait for fall & cooler weather. Can I come sit on your porch? Looks so cozy and inviting! Love the fall too. I like October the best. Then November. Love your outdoor porch!! It’s a nice 90 degree day in FL also! But I love how you inspired us for cooler days ahead. Thank you! What a lovely relaxing space. I can imagine watching the sunset and a cult hot cider. What a comfortable place to sit back and enjoy the wonderful fall weather and changing color of the leaves. Hi Anita! In SO AZ, it’s Fall when we Bear Down for our UA Wildcats and go to Apple Annie’s for Fall Harvest & Pumpkin picking at Apple Annies. Have any Country French recipes to share? LOVE the blue jugs! I love the blue bottles, especially the cobalt bottle. I have never seen blue, only green. The pew is adorable also! We have cool days and then it gets warmer here in Okla. Your porch is a great place to set in the morning, i think. Love your fall decor. Charming! I’m envious of you just finding antlers on your property. I am SO ready for some cooler temperatures. I can’t remember where you are exactly, Anita, but I think I’m somewhere south of you, just west of San Antonio. It was getting cooler, then the last few days have been miserable again! Hubby went to the coast fishing with his brothers and had to come home early because the younger brother got heat exhaustion. UGH! Every year I forget how our heat lingers. It’s hard to get into autumn decorating when the heat index is still near 100 degrees! Your porch looks calm and cool. Love it! I love your bowel with the antlers and fall pickings! My daughter and I have been out today cutting cattails for our fall decorating. We are in Alberta Canada and are quickly seeing the temperatures drop and the leaves turn colour. Our average daytime temperatures are 60 – 65° so sweater weather is here, just wish it would last alot longer and keep away old man winter. I love your site! You are amazingly creative! The bottle is my favorite! I’m curious though, everything is staged so beautifully, do you make your family walk around it?? How do you use it all in a functional way? I’d love to see what it looks like when you are actually living in the space! I pare it down a lot Christina, like the apples in the bowl and make the two bottles. Love your “On a personal note …” remarks which you’ve been including in the side bar! Can you tell me please why you don’t have the church pew facing out toward the view? It is so lovely front and back, that I would think that you would have placed it the other way. I so love your design sense that I’m interested to know your reasoning. Thanks so much! Because the back of the bench is gorgeous and it would never be seen if it was next to the house. And I wanted to photograph it so you could see the pasture in the distance. What a marvelous view you have from your porch. I like all the unusual, one-of-a-kind objects you have on your table. The big blue bottle is a treasure. For a winter table arrangement, I like the look of antlers in a rustic basket with pine branches. Somehow they work together. I love how clearly you have spelled it out. Do you ever have demijohns for sale in your shop? Love your style, always. Anita, I absolutely love the way the bowl (box?) looks ~ it’s casual ~ not “perfectly posed!” I think I’ll hunt a dough bowl next trip to Canton’s First Monday! I usually go with friends for a day trip each month to Canton from Dallas ~ but it’s been far too hot recently! We really hope that by the first part of October the temps will be more Fall-like! And a dough bowl will encourage me to bake bread (as will cool temps!)! One shop has hundreds of reproductions (in colors too) and in all sizes! I want the real thing, but I’m not quite sure how to tell!?! Enjoy your posts ~ not writing just to win a gift! Love the church pew! Everything comes together so wonderfully. The table looks beautiful and homey at the same time. You have a way with decorating, writing about what you do, and relating to your audience that is incredible. I am with my husband, who just got home from the hospital after open heart surgery. We would love to buy a house in the North Carolina Mountains. We fell in love with Cashiers and Highlands when we first got married 30 years ago,but after seeing all your posts on Black Mountain, I have begun to investigate a retirement opportunity there. Your posts thrill me every day and I love seeing how beautiful a home can be, with just a little tweaking. Anita, you are amazing! Beautiful porch – and view! It really looks an inviting space to spend time relaxing. I hope you get some cooler weather so you can sit out there with a sweater. It’s not any cooler here in NJ. We are expecting temps in the 80s again this week. Love your blog Anita ! 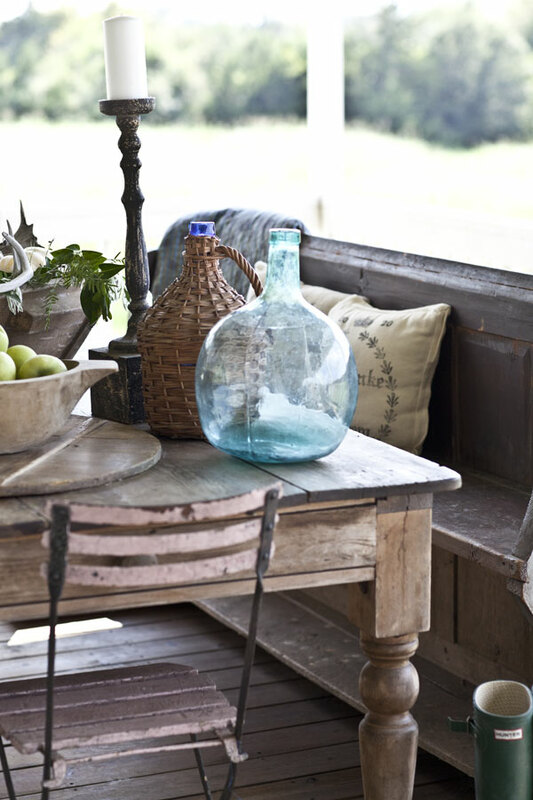 And love the simple fall decorating of your porch table! I can identify with you probably because I live in Tx. too, just south of DFW. But we love the hill country and come down every chance we get. Actually went to Round Top last spring for the 1st time….totally overwhelming, but found so many goodies! Fall hasn’t reached us yet either, humidity is horrible right now, but I’m decorating for Fall trying to get it here faster. 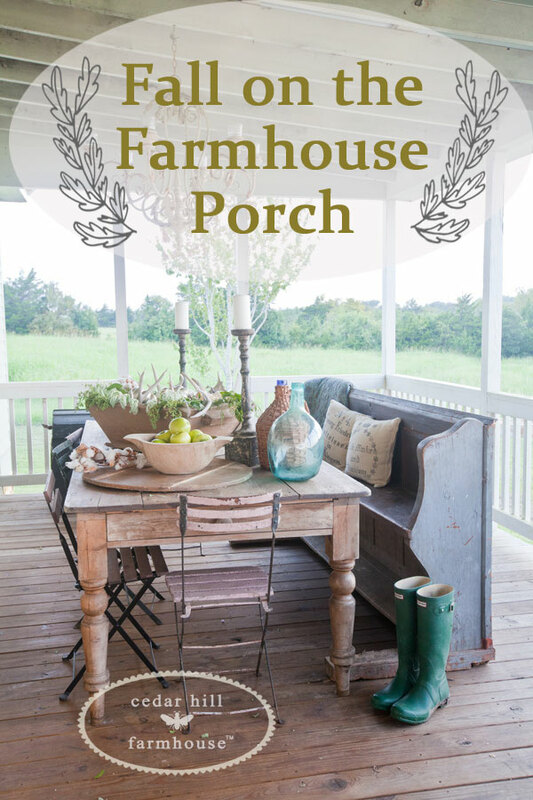 Love your farm table on your covered porch! Our 2 porches on the back & side of our Country Victorian home aren’t wide enough to hold our farm table with the chairs pulled out so it’s on our flagstone patio under a huge oak tree. Love it, but we have to cover it every time rain is coming in! So, with all of that said, it kind of prohibits me from decorating the table like I would if it were covered. Thanks for sharing your life! We get a lot of wind on our back porch, so I can’t leave it like that, but wanted to share it as a decorating idea with you. T table under the tree sounds awesome. We tarp our tables when the weather is bad, because the wind blows the rain on the back porch some. Anita, thanks for replying back! 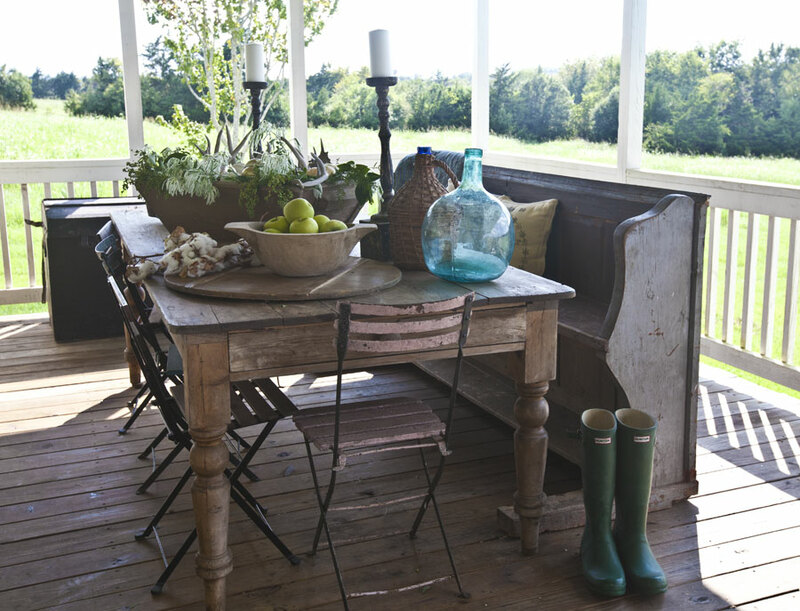 I’ve wondered if everyone that has farm tables on their covered porches/patios have problems with the rain, they always look so great on the blogs & magazines! Makes me feel better to know that we’re not the only ones out there running to cover our table & chairs when a shower pops up! New to your blog but love your look. Thanks so much for this beautiful post! Your porch looks so relaxing. I love the pew too! I love the table set up on your porch. I was thinking of the effect that each of the objects had on me. The old wood, the woodsy antlers and clear blue glass made me think of walking across the porch wearing old leather boots, and maybe a flannel shirt. Then the fabric and the cast iron with the yummy looking dessert made me feel homey and drew me in. I can hear the sound of my boots and the chair as I’m pulling it our to sit and have some of that dessert. Yum! Well done! Wow Cheryl, you must be a writer!! Love your porch Anita. It’s so very inviting. Love N.C. too. Enjoy your visit next month. Love your ideas and this style. Loved too.being able to see others sharing theirs. Where I live in South Georgia it still feels like summer—-hot and humid! Can’t wait for crisp Fall mornings, beautiful colored leaves, and that brilliant blue Fall sky! Love your porch decorations—especially the church pew and the bottles! Love your ideas. You inspire me with each post. I enjoy the brisk mornings of fall. love your decorating and I am so looking forward to cooler weather as it is still hot and humid in Southern New Jersey. I love when the night is brisk and a breeze blows your curtains. October is one of the prettiest months of the year. Love your big blue bottle and of course the Hunter Boots added to the mix. Also the apples remind me of Fall. It’s cooler here in Michigan but we’ve had some recent days in the 80’s. I love the colors that you put together on your porch – soft and lovely. I have an old church pew on my front porch. My husband carved out initials in it around 50 years ago. Love your sense of style!! Fall and sweater weather…love it! 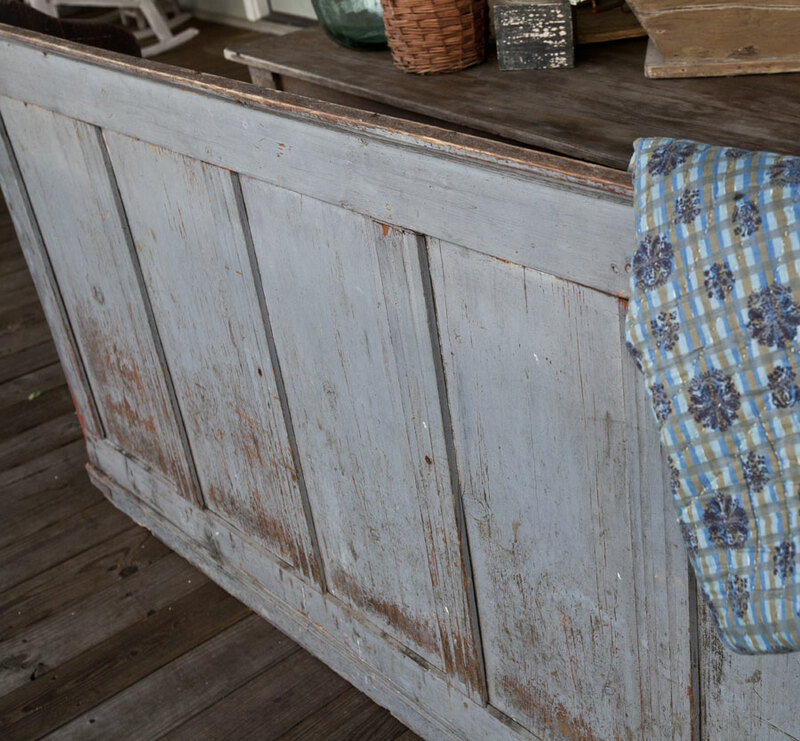 The farmhouse look is for everyone. The porch is awesome…so cozy and inviting. Very inspiring ideas…..love the church pew…..love the box filled with antlers/cotton/etc. 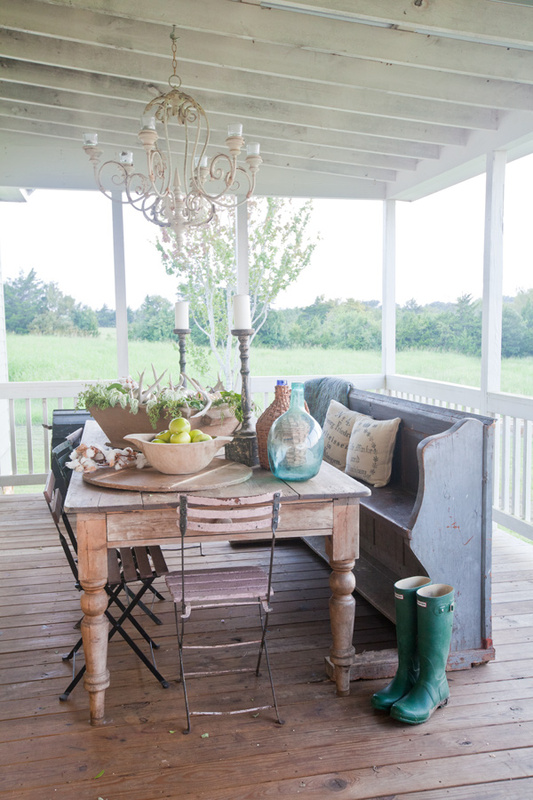 There’s nothing like a big country house porch and yours is so beautifully styled!! Looks comfy and inviting…thanks for the Autumn inspiration!! Your porch looks so beautiful Anita! I love the church pew, it loos so amazing! Seeing that makes we want to have a porch so badly!! Wow, love it Anita! So lovely! Thank you for the ideas to add for a farmhouse look. Love visiting your blog.